I have been a Lumix M43 user since the Panasonic GF2 launched in late 2010. The first impression of a Lumix Micro 43 camera is that it really make a balance between weight and quality. Afterwards I got my Panasonic GX1 in late 2011 and then, recently the Panasonic GX7. Just like other Lumix M43 series camera, the design of GX7 is very user friendly and makes for easy operation. The control panel is awesome, I can easily change the settings such as ISO, WB, AF point etc. through the cross directional pad. But the camera also has a touchscreen, and it is excellent when compared with other current camera with such feature. I can easily change the menu settings with my finger just like I was using my iPhone. The tilting LCD monitor and tilting EVF is very useful for low angle shooting, it would be better if the monitor had 180 degree titling function for self portrait shooting. I'm always surprised at the high resolution LCD monitor, the colors really pop out. However, I've been cheated before by the first impressions when looking at the monitor, so I always check in Photoshop. The built-in stabilizer is useful for those lenses without anti-vibration design, such as the pancake lenses and the Panasonic Leica 25mm 1.4 DG. It is now possible to use slower shutter speeds with these lenses for creative photography. The Pansonic GX7 JPEG engine does not oversaturate the images, the color is close to natural and looks a little bit grey, just like underexposure of about -1/3 stops. I think the color performance may not satisfying to those who expect high saturation in their images. But I don't care too much as I always shoot in RAW. You can always push the saturation up in Post-Processing. Compared with the Panasonic GX1, I think the image color and ISO performance have not been significantly improved but that's not a scientific statement. However, for the dynamic range, there's an obvious improvement. Say in extreme lighting source such as backlit environments, you can find more details in the files. I do think the DR performance is more important than ISO performance when Post Processing. Low light quality is acceptable but don’t expect the image to be too high quality, it gets very noisy in dark environment at high ISOs. The electronic rolling shutter is silent and it's an advantage for Street Photography. However, you might get some horizontal lines under fluorescent light environment. It's worse as the shutter speed gets higher. This problem maybe solved in the future as the technology improves on electronic shutters. You can always use the mechanical shutter and the bands are a non issue. There is no doubt that the Autofocus is fast and tracks very accurately, the response is quick and I can even take the photo through the touchscreen directly. It is very useful for street shooting when trying to capture the sudden moment. I think it is the fastest M43 camera up to date. This is not a professional review, only my quick impressions of using the Panasonic GX7. Please enjoy the shots I got with the GX7. What attracted you to the GX7? As most of my current gear is made up of Panasonic lenses and bodies, I needed a professional grade camera with a compact size so I upgraded to the GX7. I was attracted to the beautiful design and my experience has always been positive with Panasonics. I like low angle capture and I even always put the camera on the ground. But the former model, the Panasonic GX1 does not have the tilting LCD monitor so it is difficult to compose low angle shots. The GX7 favors these kinds of shooting. The other feature I really like is the In-Body Image Stabilization. What don't you like about the camera? – The design of the cover for the shutter release cable / HDMI port is bad in my opinion, the access panel is blocked by the LCD Monitor. I have to tilt up the LCD Monitor first when I want to open the access panel to connect the shutter release cable. -The rubber material of eye-cup (DMC-EC1) is not durable and is easy to get scraped. -Compared for the GX1, when I used the exposure bracketing function and held the shutter button, the camera would then continuously shoot, say 3, 5 or 7 photos of different exposures. However, for the GX7, I need to press the shutter button again and again, image after image. So it means that for 7 stops exposure bracketing, I need to press the shutter button 7 times. So if I have no tripod and have to handhold the camera, the photo alignment might be way off because the photos cannot be taken continuously, that's an issue for HDR processing. How did you take your street photos? On AF or MF? I always shoot the street photo in AF mode, focus setting is on face detection. I use the electronic shutter so that I can shoot in silence. I tried the wifi capabilities of the GX7, where I can shoot from my smartphone. The response is very fast when you use the touchscreen on the phone to command the camera. Even though I use the wide angle lenses and get very close to my subjects, it is still not easy for them to become aware of my presence taking their picture. Does the GX7 have focus peaking? Yes, the GX7 has a focus peaking function when the camera is switched to MF mode, the default color in is blue and you can change it to green or yellow via the custom menu setting. What lenses do you like with the GX7? For landscape photography, I very much enjoy to use the GX7 with the Lumix 7-14mm lens. The quality is really awesome and it is an equivalent to 14mm-28mm in 35mm format, this is the widest lens in M43 system. It handles distortion and chromatic correction really well. Especially when doing architectural photography, I found that the lens correction is well done. As you may know the buildings in Hong Kong are tall and crowded, even if I use the 7mm end to capture the buildings in narrow space, the barrel distortion is not significant. 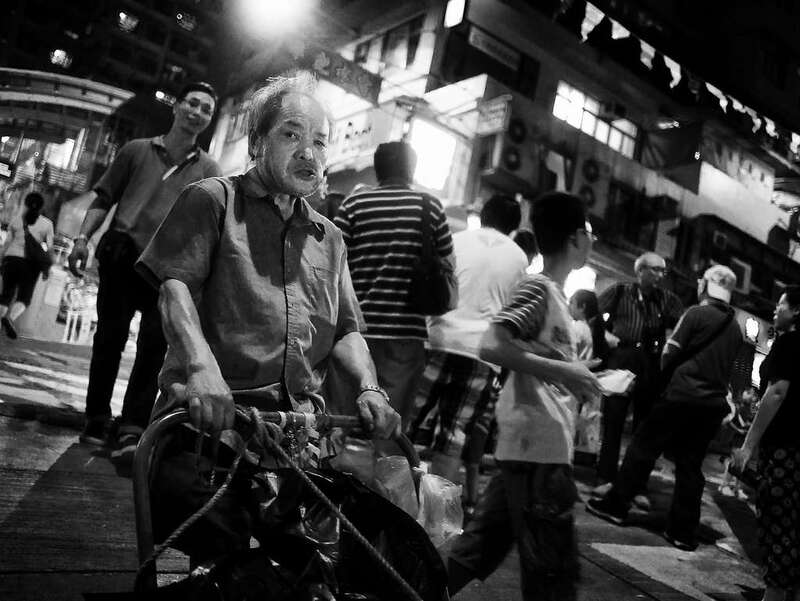 William Leung is a Photographer living and working in Hong Kong, China. Congratulations in your wonderfully vivid GX7 photos. They certainly are most impressive. I used to have a GF1 and now a GX1, but I don’t think I get such excellent clarity as you are able to produce. I notice you said you shoot RAW, so I guess you must be doing some clever post processing. Some of the shots look like very good HDR. I have read that the EVF is hard to see in bright sun light, do you find this to be true? I am trying to decide to go mirrorless after 30 years of slr and dslr. Great review. Very much appreciated. I know the GX7 is a little long in the tooth now, but I am planning on picking one up this week. Your sample images were very nice. A lot of reviews don’t include images or they are not that great. Yours really stood out. Just read your comment about needing to press the shutter button each time when you do auto bracketing. In fact, you don’t. In the menu, go to Record > Auto Bracketing > Single/Burst Settings, and choose the multiple rectangle setting, which is burst. Then the camera will fire off all the auto bracketed shots at once, depending on the burst settings you’ve set in Record. Thanks for that Carl, somebody is bound to find it useful! Hi William. May I ask for an advice, please ? I’m an amateur street photographer and I owe an Olympus OMD-EM5. Many people say it’s a perfect gear for street photography but it takes about two seconds from power-on to first shot and about 1.5 seconds if you’re waking it from sleep. Will I face the same issue with the Panasonic GX7 ? Hey there, I don’t think he had an OMD. But why can’t you just extend the sleep-turn off time? Hello, great review and amazing pics. very well pic definition. my eyes love it ! it’s too bad that you didn’t write which lens you did use for each pic. Even if i know post processing has been made to make them look better, i would be happy to know which lens give you a better start to work with.